Ted is holding two baby California Kingsnakes he found on a customer’s property. This customer was concerned that the snakes might be poisonous and might bite. Actually, Kingsnakes are very beneficial to have around your rural property since they are natural hunters of rattlesnakes. 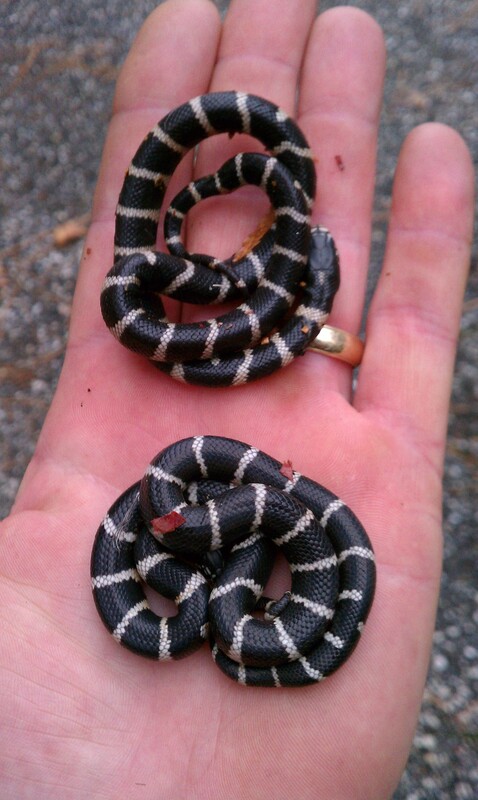 Kingsnakes earned their name because they prey on and eat other snakes. They are equipped with an enzyme that breaks down the venom from poisonous snakes including rattlesnakes, Coral snakes, cottonmouths, and copperheads. Impressive, huh? Kingsnakes are not poisonous but they may bite if frightened. Some of their other defenses include an angry hiss as a bluff tactic, vibrating its tail in dry leaves to mimic a rattlesnake, or it may roll into a ball and play dead. They are one of the most popular snakes chosen as pets due to their ease of care and adaptability, not to mention their beauty. Common kingsnakes’ body scales are smooth and glossy and come in a wide range of beautiful and vibrant colors and patterns. In California, they typically have wide dark bands separated by cream-colored bands. The Sonora Mountain kingsnake of Arizona has narrow red and white rings separated by thin black rings. In the southeastern U.S., the scarlet kingsnake has broad red rings, narrower yellow rings, separated by thin black rings. So if you see one of these extraordinary snakes on your property, consider yourself lucky to have this natural pest control partner. And if you find a snake but aren’t sure whether it’s poisonous or not, don’t approach it—just give us a call!